Got the awful Sunday night/Monday morning blues? Stop grumbling. Sure the weekend’s over, but there is something to celebrate—a recent study published in the American Journal of Preventive Medicine found that Monday is the healthiest day of the week. Followed by Tuesday. Things get progressively worse from there. 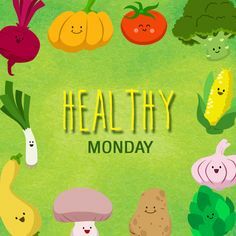 I’m sure it comes to no surprise to the tried and true dieters out there, but Monday is the day we pledge to make healthy choices and repent on all of our eating sins of the weekend. Here, I have some tips that will help you establish a healthy baseline for the rest of your week. Feel free to rinse and repeat on Tuesday, Wednesday, Thursday, and so on. Gretchen Rubin, author of The Happiness Project, recommends always exercising on Monday. Not only will this establish a positive pattern for the rest of the week, but you’ll flood your system with endorphins that will make you all the happier to face Tuesday! Starting the week off with a game plan will help keep you on track for the rest of the week. You may even want to spend a few hours on Sunday night prepping your lunches and dinners for the week ahead. A recent study performed by the Obesity Society found that plant-based diets showed higher weight loss than conventional diets, without emphasizing caloric restriction. You don’t have to go full-blown veggie to take advantage of these benefits—try starting your week off with Meatless Monday. In her new book The Doctor’s Book of Natural Health Remedies, author Peg Moline stresses the importance of un-stressing to maintain a healthy weight. Chronic stress prompts a surge in the “fight or flight” hormone cortisol, which can tear down muscle fiber, impair blood sugar metabolism and boost the brain chemical neuropeptide Y, which sparks cravings, according to Pamela Wartian Smith, M.D., codirector of the master’s program in medical sciences at the University of South Florida College of Medicine, who Moline interviewed for the book. Meanwhile, losing just an hour of sleep each night for three days can prompt a surge in the hormone ghrelin, which stimulates appetite, and a slump in the hormone leptin, which tells us when we’re full, says Norfolk, Va.-based clinical psychologist Michael J. Breus, Ph.D., coauthor of The Sleep Doctor’s Diet Plan. Deep sleep, on the other hand, fuels production of the fat-burning human growth hormone (HGH). So, take a load off, enjoy a healthy meat-free dinner, and walk away the stress of the day. Incorporating these Monday habits will mean a healthier you come Friday.